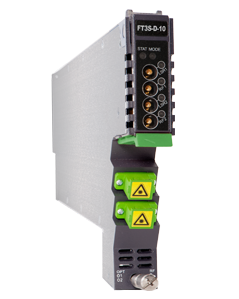 The 1310 nm Forward Transmitter Module - Standard series (FT3S) is designed to plug into PBN’s latest generation Advanced Intelligent Multiservices Access platform - the AIMA3000. 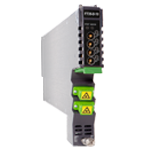 PBN AIMA3000 FT3S series advanced forward transmitter is available in single and dual port configurations. It is designed for multi-services operators (MSOs) to increase network capacity to satisfy an ever-growing subscriber demand for more bandwidth. 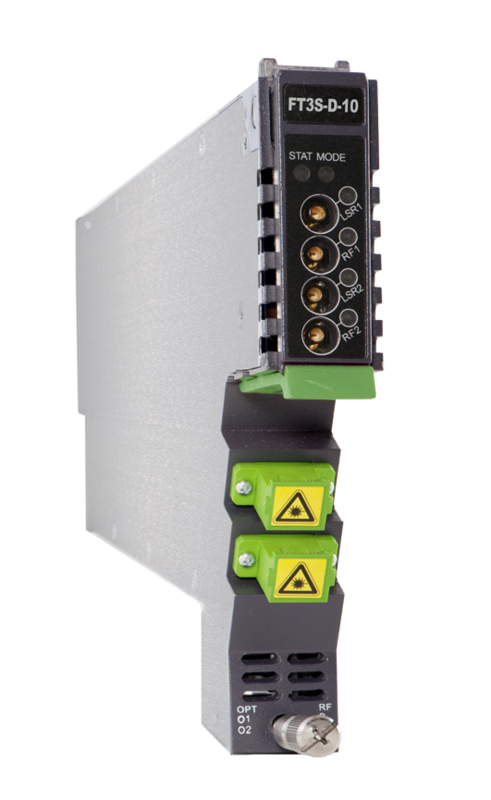 The FT3S Multi Quantum Well (MQW) Distributed Feedback (DFB) laser transmitter module allows for full-spectrum analog/digital broadcast and narrowcast channels over the entire 1218 MHz space, which provides utmost flexibility for MSOs during the all-digital transition. The laser transmitter module is available in optical power levels from 2 dBm to 15 dBm (1.6 mW to 31 mW). The module offers a superior frequency response, as well as an extremely low distortion profile and low noise characteristics. The FT3S incorporates specialized circuitry to deliver the best possible CTB and CSO performance of up to 1218 MHz. It employs the latest in broadband linear amplifier technology. In addition, it has a cutting-edge optoelectronic design for the delivery of high-quality transmissions, in both analog and digital formats, over passive fiber-optical networks. (2) Three mini-SMB connectors on front panel: one each for BC and NC inputs and one to measure RF input before the laser. (3) Four mini-SMB connectors on front panel: Two NC inputs test ports and two to measure RF input before the laser. (4) CNR, CSO, CTB and MER are loaded with 30NTSC+117ch QAM256. All are measured with PBN reference optical receiver with 10km single-mode optical fiber 0dBm. for non CWDM/OBand application scenarios, and the default optical wavelength is 1310nm±10nm. port, output power 2dBm, FC/APC connector, bandwidth 45-1218 MHz. (2) X2 is only used in dual transmitters versions and in this case X1 is the first channel, X2 is the second channel. Default spacing of CWDM is 20 nm. For more wavelength configurations, please contact your PBN representatives. (3) For CWDM configuration the maximum optical output power is 12dBm. It is recommend to be applied to QAM signal transmission. For other applications, please contact your PBN representatives. (4) Please contact your PBN representatives for the latest lead-time of CWDM and O-band products. (5) 1G version is only for single port models.